I previously wrote (link here) about the trademark infringement lawsuit filed by California cupcake maker Sprinkles Cupcakes against rival cupcake maker Famous Cupcakes over Sprinkles’ registered "nested circle design" for "bakery goods." 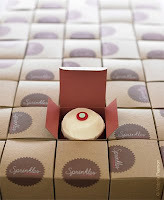 The news reports out yesterday (link here) report that U.S. District Judge Percy Anderson denied Sprinkles’ Motion for Default Judgment in its lawsuit to stop Famous Cupcakes from using its “toppers” in the center of its cupcakes (see picture below). The court supposedly cited “problems with Sprinkles' court filing.” Sprinkles’ attorneys have said they will refile their Motion after making the required corrections. Anybody know what was wrong with Sprinkles’ Motion? Ryan - Thanks for your blog. In answer to your question, it was a denial of a default judgment rather than a denial of a preliminary injunction. 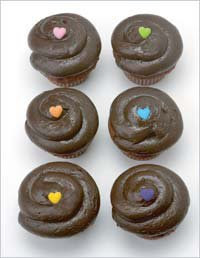 Judge Anderson in the CD Cal denied the motion because it appeared that Sprinkles had not served Famous Cupcakes through its registered agent or primary business (serving a woman in Sacramento whose tie to Famous Cupcakes was unexplained). Oops. The media reports were not clear what exactly the motion was, but it sounded like a motion for preliminary injunction by the way it was reported.